NAMM 2019: Eddie Van Halen’s original - and bonkers looking - Striped Shark came into being when the notoriously mod-happy guitarist took a saw to the angular offset body of his guitar. The result was what looked like teeth protruding from the wood. EVH then added a coat of silver paint and tape, and finally a spray can of burgundy Schwinn bicycle paint to finish. 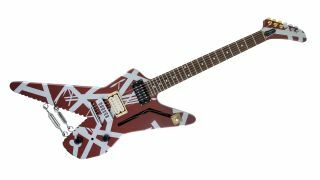 The guitar was premiered during Van Halen’s first World Tour back in 1978 and appeared on the back cover of the Women and Children First album. It’s since become a firm fan favourite. The all-new EVH Striped Series Shark in Burgundy with Silver Stripes pays homage to that original guitar and features an angular ash body with a rock-solid set maple neck, carved to a modified ‘C’ profile. The hockey stick headstock matches the paint job on the body. The Shark is fitted with custom EVH Wolfgang alnico 2 Humbucker bridge and neck pickups to help deliver power and articulation with bags of sustain and a balanced EQ curve. Like the original, the bridge pickup features parchment bobbins with metal braid wire, while the neck pickup features black bobbins with metal braid wire. The low-friction volume knob has a treble bleed cap provides to aid high frequency retention at lower volumes, making for dreamy swells, while a chrome-plated solid-brass harmonica bridge is on hand to boost attack, presence and sustain. Other headline features include a 12”-16” compound radius Pau Ferro fingerboard with 22 jumbo frets and white dot inlays, black numbered speed knobs, three-way toggle switch housed on a brass mounting plate, brass nut, gold and chrome custom EVH-stamped Gotoh tuners and chrome eye hooks with turnbuckles. If you'd like to own a unique slice of EVH history, it'll cost you £1,299. For more on the Shark head to EVH Gear.